At Anaheim Fullerton Towing, our customers’ needs are our top priority. We provide a wide range of towing and recovery services throughout Orange County, from helping with a lockout or jump-starting a car, to uprighting a tractor-trailer. Over the five decades we have been in business, we have safely delivered numerous vehicles to a variety of destinations locally, regionally and long distance. Thousands of satisfied customers throughout Anaheim, Fullerton, Orange, Placentia, and nearby areas rely on us for our quick response times, exceptional service, and highly skilled drivers. Our clients range from local, state and government agencies, to commercial accounts, roadside affiliates and the general public. 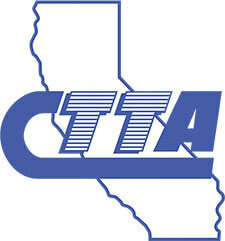 Our loyal drivers have between 8-25 years of experience each, and are certified through the California Tow Truck Association. They are well known for their courtesy, professionalism, and ability to get you out of a bind no matter what the task is. We maintain a high standard and are proud of the safety record of our tow operators. Our fleet of versatile, light-duty tow trucks and lowboy trailers are designed to haul all types of cars and light trucks, including low clearance vehicles (lowriders), all-wheel/4-wheel drive vehicles, 4x4s, and more. They come fully equipped with either state-of-the-art wheel lift systems or flatbed carriers. In addition, we have all the right tools to handle even your most delicate towing and recovery needs, including special tie-down equipment, wheel lifts for multiple vehicle transport, and removable rails for wider loads. Our carriers can also be used as a flatbed or loading dock to safely load and unload cargo, or for transporting goods and small construction equipment. With the automotive industry producing more low clearance vehicles, the flatbed carrier has now become the standard of the towing industry. Our light duty 21 ft. and 22 ft. flatbeds feature low-angle loading for safely towing even the lowest profile automobiles without damage, and work well for hauling specialty vehicles of all kinds. 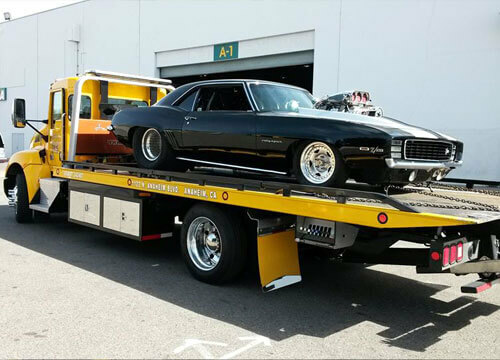 Whether you need to tow an antique, classic car in Anaheim, an all-wheel drive SUV in Buena Park, or a pair of motorcycles in the City of Orange, AF Towing has the skills, expertise, and advanced towing equipment to ensure fast, efficient service throughout Orange County. AF Towing are local experts in providing fast and reliable motorcycle towing services for all of Orange County. Although smaller than a car or truck, a disabled or damaged motorcycle can be just as much of a problem for an owner. We realize that motorcycles need special care if future damage is to be avoided. That’s why we use advanced towing carriers that have been specifically designed to haul all makes and models of motorcycles. With their years of hands-on expertise and industry training, our highly experienced tow operators know the best ways to handle your bike to ensure safe and secure transport to your intended destination. Our fleet of trucks is available 24 hours a day, 7 days a week, 365 days a year to handle all of your towing and recovery needs. 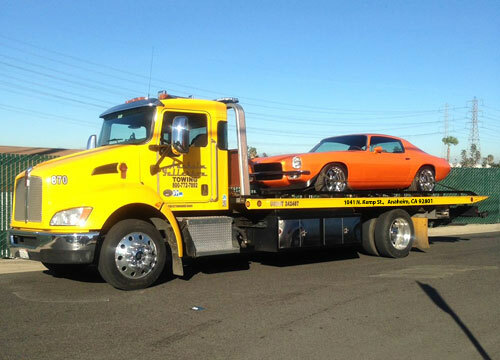 In most cases, we can send the right flatbed or tow truck within minutes of your call. We also offer after-hours releases for an additional fee. 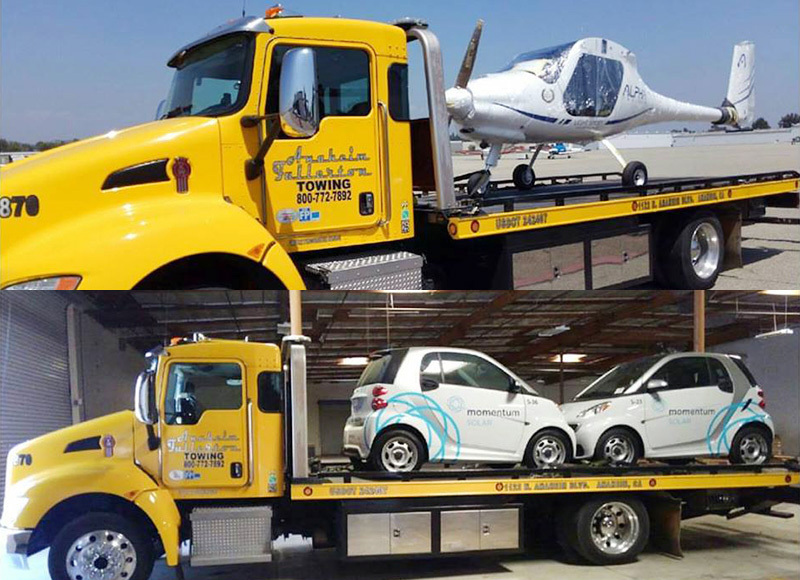 These photos show our light duty tow truck towing two smart cars and a two-seater plane. 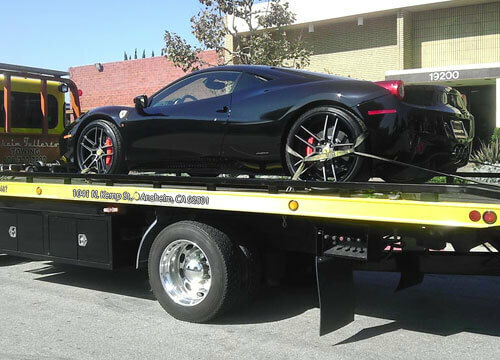 We offer expert towing services for Anaheim, Fullerton, Orange, Tustin, and surrounding areas.